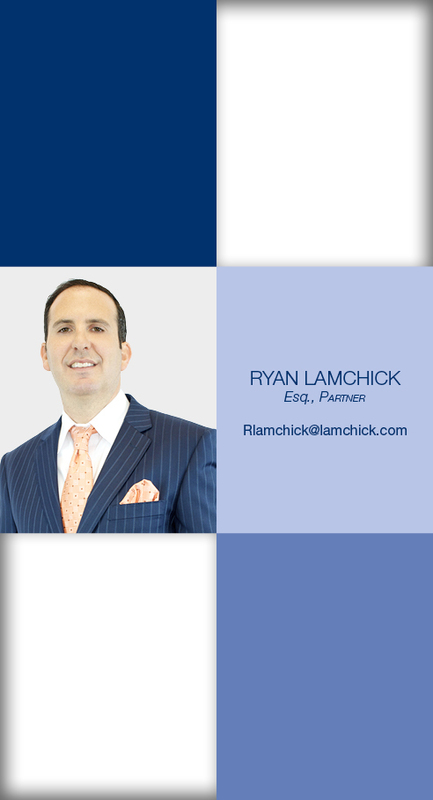 Ryan Lamchick, Esq. concentrates his practice in all aspects of litigation, including commercial disputes, real estate, foreclosures, construction. Mr. Lamchick attended Syracuse University School of Management, where he earned a Bachelor of Science in Finance and was the only student recruited out of his graduating class to participate in Morgan Stanley’s Analyst program in New York City, which he successfully completed. He went on to attend the University of Miami School of Law, where he graduated with a J.D. Mr. Lamchick was selected by his peers as a 2012 Florida Legal Elite Top Up and Comer, published in Florida Trend’s Magazine Legal Elite. He was then named a 2013, 2014, and 2015 “Rising Star” lawyer by Florida Super Lawyers Magazine. No more than 2.5 percent of lawyers are named to the Rising Stars list, which is published annually in the June issue of Florida Super Lawyers Magazine as well as The Wall Street Journal. More recently, Mr. Lamchick has been selected to Super Lawyers in 2016, 2017 and 2018. His published work includes “What You Must Know About Notices to Owner”, “A Contractor’s Defense: The Spearin Doctrine”, “Ink the Deal”, “The Thrill is Gone: Responding to a Defect Claim”, and “Lien Over: Things to Consider When Releasing Your Lien.” He is admitted to the United States District Court for the Southern District of Florida and Florida’s state courts.